he “pit bull” controversy in America is long on rhetoric and short on reliable information. I even felt compelled to put “pit bull” in quotes because there is no pit bull breed, per se — it’s a classification encompassing breeds related to the Staffordshire Bull Terrier — but I will use the term for simplicity’s sake. Supporters of breed bans say statistics show that pit bulls are the top offenders when it comes to dog bites, especially fatal ones. Pit bull proponents claim those statistics are tainted because of breed mis-identification and media bias. For those of us who don’t have a dog in this fight, so to speak — those who don’t rescue pit bulls or actively advocate against them — trying to determine the truth of the matter can be extremely difficult and time consuming. When it comes to man’s best friend, passions run high. I have many Facebook friends on both sides, and it seems that for every picture of a pit bull cuddling with an infant, a news report of a bloodied toddler with puncture wounds and lacerations appears in my news feed. There seems to be no viable solution to the controversy. I believe that we are at such an impasse that it’s time for a somewhat radical solution. I propose that pit bulls be repurposed by law enforcement agencies similar to the way confiscated guns could be repurposed for police or military use. Yes, this might amount to an eventual ban on the pit bull type, but I believe it would ensure a minimal loss of canine life. I’m not proposing this solution simply because we’re at an impasse. I want this proposal to start a new thread in the current controversy. And I believe that determining whether or not pit bulls are inherently dangerous is of paramount importance, and especially complicated. I think we need to determine whether or not dogs descended from or bred with the Staffordshire Bull Terrier have an element of risk not found in other popular breeds like Labradors or Golden Retrievers. Melissa Weaver, Founder and President of Lodestar: Guiding Angels for the Blind, who also maintains a private dog training business on the side, told me that pit bulls “seem to tend to lack impulse control and have a high reactivity to stimuli.” Prior to Lodestar, Weaver worked as a certified Guide Dog Mobility Instructor for Leader Dogs for the Blind in Michigan, and before that as a handler of sled dogs for Alaska Icefield Expeditions in Juneau. Weaver touches on the crux of the issue: When it comes to pit bulls, can we determine if they’re inherently dangerous or if their alleged bad behavior is due to poor handling — or a combination of both? As a former dog trainer myself, my experience has been that any dog, given the perfect combination of circumstances, has the potential to bite. I was a certified Guide Dog Mobility Instructor for The Seeing Eye for 11 years, and I’m sad to report that most of the dog owners I encountered on the street either hadn’t had training in handling their dogs or, for whatever reason, weren’t able to execute that training properly. I trained guide dogs every day on the streets of Morristown, NJ, where everyone and their mother has a dog. I’ve also regularly trained dogs in New York City, and I’ve been to every state in the nation working with the dogs of our graduates in inner cities, in quiet suburbs, and in even quieter countrysides. I’ve seen dogs on leash and stray dogs in every one of those environments. Are some dogs more dangerous than others? Do dogs that have been bred for a purpose still have that purpose in them? Thankfully, I’ve never had to protect any of my dogs or the dogs of my graduates from an actual dog attack, but I have encountered aggressive dogs and irresponsible dog owners. I know how to identify and avoid a dangerous canine situation, so I’ve been lucky. What I’ve learned about dogs is that both sides of the debate about pit bulls are right, to an extent — it’s nature and nurture. But it’s still important to try and tease out the nuance of this formula because ignorance in this regard can be deadly. Yes, oblivious dog owners can be a danger to society. Yes, intact male dogs of any breed are more likely to be aggressive than their neutered counterparts. But what about the assertion that some dogs are inherently more dangerous than others? Do dogs that have been bred for a purpose still have that purpose in them? I believe they may. For centuries dogs have been selectively bred for certain physical and behavioral characteristics. Some dogs have been bred to be guards, some to fit inside your Gucci bag, some to bait bulls or kill vermin, and some to herd livestock. Take the German Shepherd Dog as an example. This is a breed that is near and dear to my heart. My Shawn just turned 10 years old last month — he’s a beautiful example of the breed, both physically and temperamentally. He has an excellent conformation, and when he gives you his full attention it feels like he’s reading your mind. He was born and bred at The Seeing Eye and I was fortunate enough to be his trainer. He went through the full four months of our training program, and he was smart, willing, and tractable — but he was ultimately released from the program. It turned out he was also suspicious. If you peruse any of the German Shepherd Dog breeding sites on the Internet, you invariably come across the term “protective” or “suspicious.” German Shepherds are naturally protective of their families and homes. They look upon strangers with distrust, especially on their own territory. Otherwise they’re generally aloof to strangers, unlike Labradors or Golden Retrievers who act as though they’ve just found their soulmate. Think Dug, in the Disney movie Up. German Shepherds tend to bark first and ask questions later — and a suspicious dog may bite you. Despite the best scientific efforts of world-class organizations like The Seeing Eye, the protectiveness and suspicion of the German Shepherd Dog has not been completely “bred out” of the breed. They don’t learn to be suspicious; it’s part of their nature. Knowing this, I would be as wary of adopting a German Shepherd Dog from a shelter as I would adopting a pit bull. I’m even wary of Shawn, and I know every medical and behavioral detail of his whole life, including his entire pedigree. Yet I monitor every interaction he has with other dogs and with people. Even after the initial greeting, I chaperone the entire time. Dog breeding is a very complex undertaking. That’s why The Seeing Eye employs a full-time geneticist. Guide dog schools breed and train dogs to guide the blind, obviously, and the schools breed for things like willingness to work, tractability, and soundness in the face of environmental stressors. But training a guide dog is more about teaching it a set of skills, skills that don’t get passed on to its progeny. And training a dog to be a guide requires that the dog, a natural predator, go against its basic drives of hunting, chasing, and killing. Encouraging a dog to bait a bull, kill vermin, or fight another dog, however, plays right into those impulses. So if you breed dogs that exhibit those impulses to a higher degree, you will get offspring that exhibit those same traits. Because those traits are in their biology, they don’t have to learn them. This doesn’t mean that every individual pit bull is a stick of dynamite with a short fuse. Nevertheless, the pit bulls sitting in shelters waiting to be rescued are descended from ones that were bred for the sport of bull baiting, bred to amplify those natural canine drives of hunting, chasing, and killing. And it’s likely that they are the ones that have been exposed to abuse and neglect. That’s why they’re there. If we can acknowledge the German Shepherd Dog’s hard-wired instincts for suspicion and protectiveness, I think we also need to recognize the Staffordshire Bull Terrier’s instinct for aggression. So I do think pit bulls have an elevated risk because of their breeding history. The two main solutions on offer, however — breed-specific legislation (BSL) and enforcement of existing dog control laws — are ineffective. The Humane Society notes that BSL isn’t likely to work because it’s almost impossible to properly enforce. It seems obvious that BSL isn’t a good option anyway, because even if it did work, it would be like throwing the baby out with the bathwater. Thousands if not millions of innocent dogs would be consigned to death along with the dangerous ones. And human nature being what it is, we know that dog owners won’t abide by existing animal control laws anyway. Everyone thinks their dog is an exception. Take Morristown, NJ, as an example, where The Seeing Eye has been operating since 1965. 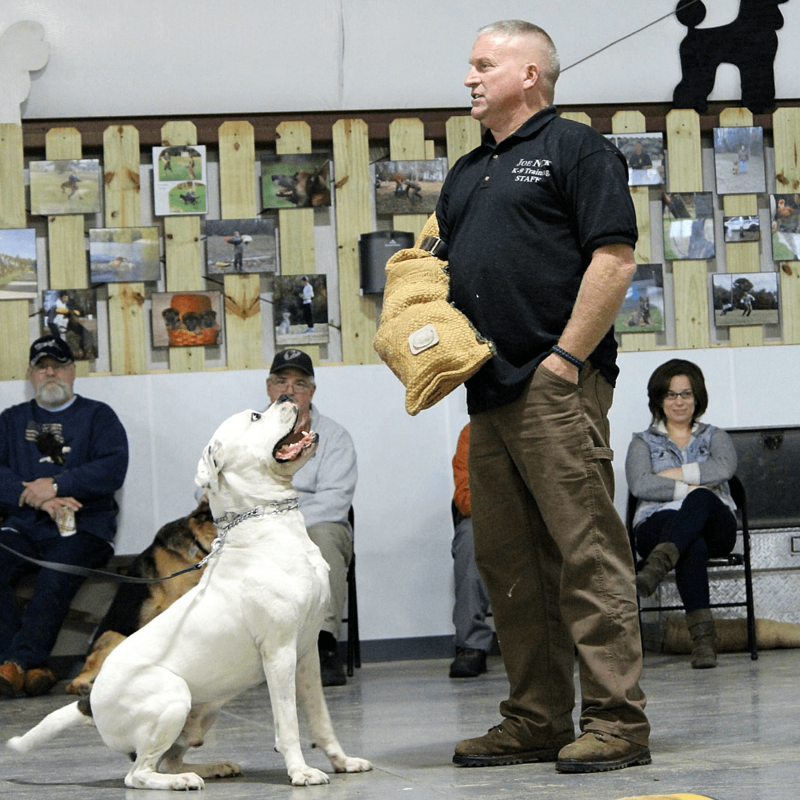 Despite that fact that each month there are as many as 20 instructors with dogs in training and up to 24 blind students in training with their dogs around town, local law enforcement is notoriously lax when it comes to its animal control laws. And each of those dogs costs about $42,000 to train! On an almost daily basis, dog owners leave their dogs tied to the outdoor cafe at the local Starbucks while they go in and get their coffee. Despite the fact that it’s against the town’s animal control ordinances to leave a dog unattended, I never saw a police or animal control officer give a ticket to anyone in the 11 years I worked there. A dog left tied to a fence or a pole in that situation is a danger to other people’s dogs and to passersby, to say nothing of the danger to that dog itself. While researching this issue, I was originally hoping to stake out a position in the middle ground, but I realize it’s not feasible to promote caution with regard to the pit bull without sliding down the slippery slope towards an outright ban. I know what this means. When you ban and confiscate guns, for example, you presumably destroy them so they don’t fall into the wrong hands. So if you ban pit bulls, they would ultimately be destroyed, too. That idea nauseates me. Media reports will deter otherwise good-hearted people from adopting pit bulls from shelters, and more and more pit bulls will be consigned to death row. Also, insurance companies aren’t likely to relax their criteria for determining coverage when it comes to so-called “bully breeds.” And the magnitude and nature of media reports will deter otherwise good-hearted people from adopting pit bulls from shelters. As a result, more and more pit bulls will be consigned to death row. That’s why I propose that pit bulls be repurposed by law enforcement agencies. There is a precedent for this. Dogs that are released from the training program at The Seeing Eye, like my Shawn, sometimes return to the families who raised them or are adopted by employees, but many of them are evaluated by law enforcement for a chance at a second career. The Seeing Eye has placed dogs with Homeland Security, The Port Authority of New York & New Jersey, local Sheriff’s offices, and myriad other law enforcement agencies. Between patrol and scent detection, there are many options for dogs in law enforcement, including identifying narcotics, chemical explosives, cadavers, firearms, cell phones, clothing, and natural gas. Some police departments around the country are already using pit bulls, and with great success. 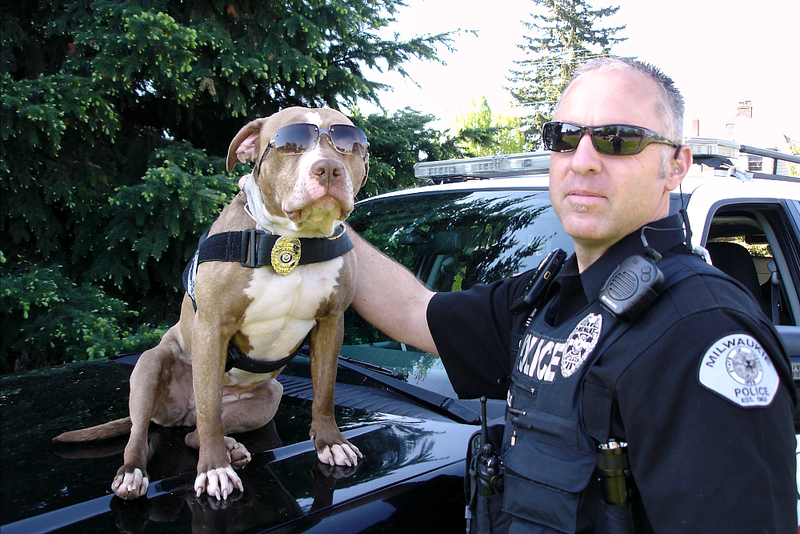 Officer Billy Wells of the Milwaukie Police Department in Oregon works with Shaka, an American Staffordshire Terrier. She was scheduled to be euthanized until she was rescued by pit bull advocate Cydney Cross from the Out of the Pits organization. Shaka went through an 18-week narcotics detection training program in New York because she exhibited a high drive, a trait essential for that type of work. Shaka initially began her career in Washougal, WA, but the police department there lost funding. The police department in Milwaukie eagerly snatched her up. Officer Wells has been on the force since 1990, and has been a K9 handler for the past eight years. He’s lived and worked with Shaka for three and a half years, and the team has been deployed over 100 times. Last year he and Shaka recovered $100,000 in illegal drug-related cash — a big win in an otherwise small town. Shaka is now 10 years old and nearing retirement. Officer Wells will offer her back to her original handler in Washougal because he was “really upset that he had to give her up — he has a family of five and they loved her to death,” Wells said. If that officer can’t keep her, Wells will be more than happy to have her live out her golden years with him. I asked Wells what his department planned to do after Shaka’s retirement. “We’ll probably purchase a German Shepherd or a Malinois so we can have a cross-trained dog,” he said. For practical reasons, many small departments around the country want dogs in their K9 units that can do both patrol and narcotics detection duties. But he told me he’d have no qualms working with another pit bull. After his career as a corrections officer, Nicholas — who goes by Joe Nick — went on to get certifications in narcotics, explosives, tracking, patrol work, cell phone, cadaver, arson detection, and search and rescue. Today, he continues to train dogs and instruct handlers for numerous law enforcement groups, search and rescue teams, and private citizens. But both Nicholas and Wells acknowledged that the same traits that make a pit bull great at police work — fearlessness and a high prey drive — also make breeds like the German Shepherd Dog and the Malinois great. And both agreed that those breeds are just as likely to be the target of litigation if they were to bite someone. “[Police department] management is reluctant to use pit bulls because of the stigma attached,” Wells said, “because of their association with the criminal element since the 1980s.” He said that in his 24 years on the force, he’s never responded to a single pit bull bite call. He has, however, responded to other dog bite calls, some involving those traditionally considered “family friendly” like Golden Retrievers. My proposal is feasible. But make no mistake, repurposing the pit bull is a huge project, and not something that can happen overnight. If we were to begin today, consider how many dogs are currently in shelters. How many are pit bulls? If those numbers are accurate, marshalling enough law enforcement manpower across the country will be a challenge. Larger cities like New York, Chicago, and Los Angeles will be ideally situated, as would government agencies like U.S. Customs and Border Protection and Homeland Security. I’m not proposing an outright ban — no confiscation of beloved pets — just the ineligibility of pit bulls to be adopted out of shelters going forward. Except instead of euthanizing them, law enforcement agencies would acquire them, test them, and train them for patrol work and scent and substance detection. If there aren’t enough officers to foster them while they’re waiting during this process, perhaps we could employ people like Joe Nick to help carefully vet foster families the way guide dog schools vet their puppy raisers, ensuring proper handling and socialization. Since even President Obama came out against breed-specific legislation, maybe we can petition the White House to appoint a “Pit Bull Czar” to oversee the repurposing project. In the long run, repurposing the pit bull for law enforcement may make the most sense all around. Hundreds of thousands of dogs would be spared and acquire a noble purpose; pit bull advocates won’t have to fight a pernicious stigma and the general public would be more at ease; and law enforcement agencies would get an enormous budget-friendly source of excellent working dogs. Some police departments pay as much as $15,000 to acquire one working dog! One thing is certain: Millennia ago we brought a wild predator into our world, and shaped and reshaped it to suit our human needs and desires, so it’s our responsibility to do something about it. And inherently dangerous or not, it’s not fair to summarily kill hundreds of thousands of these dogs every year. Pit bull advocates seem to be exceptionally passionate about them mainly because of the type’s tragic plight. But if we were to repurpose them with minimal loss of life, if we can put them in the capable hands of those who will enable them to fulfill their evolutionary destiny and flourish, would it be too much to ask for pit bull advocates to put their resources and effort into making it happen? Steve Neumann is a writer and blogger whose work has appeared in Salon, Nerve, The Morning News, and other publications. He is a regular contributor at The Good Men Project. Follow him on Twitter. The thought is nice, but the Pit Bull’s genetic dog aggression and gripping bite style is what stops this from happening. Diane Jessup tried this before, and even she could not guarantee that her Pit Bulls would not turn dog aggressive after training, having to euthanize some of her own trained Pit Bulls when the switch tripped and they became extremely dog aggressive. Police departments are not a bottomless of pit of financial and time resources, they need to feel certain that the dogs they are using will be viable working dogs upon completion of training and throughout their careers, not one that will become uncontrollably dog aggressive one, two, may five years down the road as what frequently happens with Pit Bulls. Also, as you already mentioned, police departments prefer dual trained dogs, a task that is not suitable for Pit Bulls. Estimates have it that there are nearly one million Pit Bulls dumped in our shelters on an annual basis, most abandoned due to various types of aggression, many with bite histories. Most are backyard bred with unstable histories and temperaments. There are not that many police departments in this country to handle the magnitude of this surplus. To address you question as to whether a Pit Bull is inherently dangerous, yes. They still teach genetics in high school, and yes, any experienced, knowledgable breeder will tell you that if you breed dog aggressive dogs to dog aggressive dogs, yes, you will get dog aggressive dogs. As you mentioned, Pit Bulls were bred to grip and hold onto their opponent without regard to self preservation. This is a dog fighting breed quality, as normal dogs bite and release, then either bite again or flee, it is a simple survival tactic endowed by mother nature and lacking in Pit Bulls. So, no, Pit Bulls are not like other dogs and should not be treated as such, even those that have not been bred for dog aggression, as the grip is still there. As a taxpayer, I take exception to the money and resources that would be expensed and wasted trying to create a venue that would suit the repurposing of Pit Bulls. This is not a local, state, or federal government issue. The problem with Pit Bulls is there are way too many of them, they can be had for next to nothing (poor man’s pedigree dog), and too many people fail to grasp genetics and don’t understand fighting breeds and think they can hug and kiss the danger out of a dog and are completely taken aback when Pibbles matures and becomes violent. There are many fine breeds already being bred to do an exemplary job in a dual position K9 capacity. Police dogs are bred, then their natural abilities are channeled for specific tasks suited to their genetics. What would you do with all the fine dogs out there that have already been bred for generations to excel in ta K9 venue? Would you have them stop breeding great dogs capable of dual purpose so that Pit Bulls may survive? Should we let other breeds go to the wayside to preserve Pit Bulls, and at the taxpayers expense? I do not put the preservation of Pit Bulls over the safety and welfare of our communities. I have this to say to Pit Bull advocates, there are over 400 plus breeds of dogs, many of them truly loyal, many of them very sweet, and many of them non aggressive. Pick one. Final note, I don’t believe in Pit Bull banning, that would be unconstitutional. However, when Pit Bull owners fail to acknowledge the genetics of their chosen breed, they can’t help but fail at self regulating their Pit Bulls, hence, I support BSL explicitly detailing, and enforcing, the micromanagement of the Pit Bull. Somebody’s right to own a Pit Bull does not take precedence over somebody else’s right to be safe from Pit Bulls. SHARE THIS WITH YOUR CITY LEADERS! Olympia, WA – Back in April, we reported that a handful of pit bulls seized from the Pima County dogfighting raid were chosen to be “rehabilitated” as detection dogs. Diane Jessup, the owner of LawDogsUSA, was the recipient of these dogs. In October, Jessup shut down LawDogsUSA due to lack of interest from the “pit bull community” and lack of adequate funding. “I had dreamed that LawDogsUSA would attract the best and brightest in the pit bull community and be able to grow larger than just me. She writes that the practice “amounts to a boarding kennel” and is the “height of disrespect for our noble companions.” She feels that euthanasia in her own arms is the most humane option. When you say BSL means “thousands if not millions of innocent dogs would be consigned to death along with the dangerous ones,” you forget that already nearly one million pit bulls are euthanized annually in animal shelters because they are overbred. Further, Breed Specific Legislation does not mean “kill all the pit bulls”. If you look at real BSL, it usually does not include a breed ban, and when it does, existing dogs are “grandfathered” in as long as the owners comply with regulations. Most often BSL includes mandatory spay / neuter to reduce the numbers of unwanted pit bulls (or Chihuahuas), as well as regulations around the care of these dogs, for instance, no tethering, and adequate fencing to keep them safely confined, and public safety measures including insurance coverage, muzzling or micro-chipping. 1) Recently a 2 year old police dog was euthanized for an unprovoked attack on a citizen – law enforcement will not give a dangerous dog a second chance like The Lexus Project. 2) If cops start using the dog of choice of dog fighters, criminals, animal abusers and celebrity fur mommies, that will seal the end of this pit bull fad because those demographics won’t want to own a breed that is on the right side of the law. It’s going to be harder than hard to ‘re-purpose’ these fighting gladiators who have been robbed of their pits and falsely re-named ‘pet dogs’ without work being undertaken on their fierce genetics. I know they are used for hog-hunting in some places – however, I ‘treated’ myself to a lot of videos of them doing that, and found them to be immensely cruel, violent and disgusting. These dogs didnt just catch and hold – they TORTURED their miserable quarries. They cannot be used effectively as guard dogs, as they cannot just simply GUARD, they will KILL what they can catch. They cannot be used effectively or with any measure of safety in the police service – livestock-mauling genetics would almost certainly mean a severe face/neck mauling for any perpetrator they were sent after (to say nothing of the immense difficulty of getting them OFF something they are attacking and focussed on). That leaves either EATING them or using them where their lives have no meaning, such as bomb disposal work. But I still think they would find a way to roam and revert back to type – these are not smart dogs. These are small-minded bloodthirsty gladiators with intense focus on creating victims/opponents. OR, we see a return to the days of dog-fighting as a legalised spectator sport. These dogs belong to THAT much of a niche market. These are the round pegs of history, which people are trying hard to pound into the ubiquitous square holes. From Pit to Pet without ANY work being done on their genetics. Oh, and I must add…. 36 Americans have been killed by dogs so far in 2014. PIT BULLS killed TWENTY-FOUR OF THEM. And of the 23, TWELVE WERE INNOCENT AMERICAN CHILDREN. Re-purposing fighting dogs is going to need to be more than just ‘renaming’ them (for example we now see them being called mutts, Lab Mixes, or Boxer Mixes, or Terrier Mixes). Their GENETICS have to be worked on, and worked on HARD. A turd does not become a Christmas pudding just because you rename it a pudding, any more than a lump of iron pyrites becomes a chunk of true gold just because you call it ‘gold’. Given that Pit Bull owners are immensely reluctant to spay/neuter their gnarly canines, that is going to be nigh-on impossible. The ONLY way these dogs can be genuinely re-purposed is for serious mandatory Pit Bull spay/neuter legislations to be applied and implacably enforced, and for ONLY approved breeders who are willing to breed the aggressive traits OUT of the dogs to be permitted to breed them. APBT breeders will admit that dog-aggression is a DESIRABLE TRAIT in their animals, so even locating these specialised and determined breeders is going to be the devil’s own job. Realistically, these dogs have had their day. Their true work (gripping livestock for open-field butchery and dog-on-dog fighting) is no longer needed OR legal, yet they STILL remain among us, unchanged, as joyously violent as they ever were; in the hands of absolute fools and ignoramuses who think that they are a dog just like any other dog. AND, in spite of killing more children per annum than all other breeds or types of dogs COMBINED, there STILL persists pockets of lunatics who would call this dog a ‘nanny dog’ and ‘safe around children’. Magical thinking does NOT a reality make. 36 dead Americans, 2014. Dogs killed them. Horribly, painfully and cruelly. Pit Bulls killed 24 of them. And 12 were American children. Good luck with re-purposing the most dangerous ‘pet’ dog that ever crossed the threshold, and even better luck with re-purposing a dog whose ‘work’ is no longer legal or required. Spelling error above; 2nd paragraph; apologies – “And of the 23, TWELVE WERE INNOCENT AMERICAN CHILDREN” should have read “And of the 24”. Melissa Weaver is right in her assessment of pit bulls. And when the author describes german shepherds as being naturally suspicious and protective and “bark first ask questions later” That’s true and he’s talking about being protective of its human family – not even necessarily aggressive. “Bark first, ask questions later” isn’t appropriate for a guide dog, but in pets, it is eminently safer and preferable to the pit bulls’ “attack first, no need for questions” genetic tendency. When the author or anyone talks about how they are sickened at the prospect of euthanizing pit bulls is a solution – WE ARE ALREADY DOING THAT – Is he not sickened that almost a million are killed every year already? And that’s just in shelters. That means we are killing between 2,000 and 3,000 every single day of the year. EVERY DAY. Doesn’t he find that sickening? We won’t need to kill any more than than we are already killing. We just need to ban them and prohibit breeding and we will quickly – and I mean within a year – be killing far fewer than we are right now. Because to sustain our obscene rate of killing pit bulls in shelters, 2,000 to 3,000 pit bulls a day are killed which works out to between one and two pit bulls killed every single minute of every single day of the year, that many must be produced each each year. That is to say, just to maintain their population (some believe the population is growing) – between 2,000 and 3,000 pit bull puppies are are born every single day of the year. EVERY SINGLE DAY OF THE YEAR. Now, how does taking a few to be police dogs (if that were workable, which its not) going to put a dent into 2,000-3,000 pit bulls born and killed every single day of the year. BANS WORK. The author should have done his due diligence and researched the effectiveness of bans. Here’s a list of Large and small cities with successful BSL. Please note, these are NOT interest groups; these are CITY LEADERS, POLICE CHIEFS, ANIMAL CONTROL OFFICERS, and MUNICIPAL LAWYERS who are saying that BSL is a proven success, these LAWS WORK, are AFFORDABLE, and provide an IMPROVED QUALITY OF LIFE for citizens. Every single listing is cited and sourced if you have an doubts. SEND THIS LIST TO YOUR LEGISLATORS and CITY LEADERS! These studies show that pit bull bans keep people out of the hospital and the morgue! Decline in Hospitalisations Due to Dog Bite Injuries in Catalonia, 1997–2008. An Effect of Government Regulation?, by Joan R Villalbi, Montse Cleries, Susana Bouis, Víctor Peracho, Julia Duran and Conrad Casas, Injury Prevention, 2010;16:408-410. One City’s Experience: Why pit bulls are more dangerous and breed-specific legislation is justified. My first reaction was this is a ridiculous suggestion. My second thought was even more negative. Now I am going to explain my reactions as my blood is boiling at your suggestions. First you need to ask yourself why is that police departments all over the world use a shepherd type dog for police work? I do realize that many police forces in the US use the Belgian Malinois, and that is because of bad breeding issues in the US of the German Shepherd — dysplasia being one problem, the breeding out the work drive another. The shepherd is a herding dog, one bred to work with people and livestock. They do not use guard dog breeds or terrier breeds as they are more independent and not bred to work with people and follow directions and commands, The best working Shepherds (either German or Belgian Malinois) are responsive, obedient and have a strong work ethic. Even if they are suspicious and protective those are traits that work well with the responsive nature. Those dogs will protect their handler. Terriers in general are persistent and stubborn and tenacious. You yourself mention that pit bulls have an aggression issue. Most reputable pit bull type dog sites mention that dog aggression is normal in pit bulls — the UKC even mentions that is a trait in APBT. Can you train that out of a dog? Most police dogs are in situations where they are around other dogs, particularly in New York City. A dog that is distracted by its own dog aggression is not going to be focused on the work. A police dog must obey verbal commands or hand signals to chase and subdue a suspect and to stop biting upon command. How would that work with the tenacious nature of a pit bull type dog? Why does Customs and Border Patrol use the Malinois? The Malinois is used for drug and explosive detection, amongst others tasks. Agriculture uses beagles. They are sometimes in the same area, sniffing luggage for drugs or agriculture in the international arrivals. I remember one year when I flew in to Miami from the Caribbean, in the same arrival area where planes from South America were arriving. To get to US Immigration, we had to go down escalators. On each side of the escalators were two shepherds sniffing people for drugs and explosives even before we got into the lines. While drug sniffing dogs are important what matters most to me are the explosive sniffing dogs. I fly between 40,000 and 70,000 miles per year. I travel internationally a lot mostly in and out of Kennedy airport in NYC, where ICE exclusively uses the Malinois for detection. There was a Malinois I used to see a lot as she worked the terminal (Terry, since retired). And let me say that I had some reassurance knowing that there was a well bred dog (they come from working lines in Europe where breeding is more regulated) on the job, doing all they could to prevent any dangerous person or substance from getting on the same plane as me. When I was younger (late 20s) I used to travel to what were then difficult areas of the world (this was before 9/11 which changed everything for me) and I remember one area that was under terrorist threats from separatists. The airport would not tell passengers which plane was theirs on the tarmac. We got bussed around the tarmac before being taken to a plane, every plane had the army guarding it. The army even searched the bus and used undercarriage mirrors to make sure the bus was safe. Every passenger and luggage (after xray) had to pass by shepherds before allowed to get on the plane. I would not have stepped on that plane or any other plane if there were some random rescue pit bulls doing the screening. Earlier this year I had to do jury duty in NYC. On my way to court I had to pass the Federal Court for the Southern District where there was a major terrorism criminal trial (google it and see how serious it was). What dogs were on the street with the NYPD to protect all those around the courthouses? Yes, purpose bred working dogs, of the Shepherd family. I urge you to rethink your proposal. I will not let my safety in the air or on the streets be compromised by some sort of social experiment to save shelter pit bulls. Oh and I volunteer with an all volunteer animal rescue so it is not that I do not like animals. I donate thousands of dollars a year to animal causes. No sane person who actually travels would support your proposal. No one wants to risk being blown up in the air because you think that there are too many pit bulls being killed in shelters (how about mandatory spay/neuter) and that they should be “repurposed”. Shepherds have a proven track record in explosive detection — why do you think they are used by the military and police worldwide? The world is a dangerous and difficult place and the US is still a target. Why on earth would you make a proposal that would jeopardize the security of the public? I notice that you are suggesting that some these shelter pit bulls go into the Guide Dog program. Why is that? Did you not think of the risks of plane blowing up over a densely populated environment like New York City? Does the law enforcement and the public of the USA not deserve the best in canine genetics to protect our lives? My answer is that we do and I am shocked that you are advocating for anything less than the best to protect our soldiers, airports, police and the public from those that do harm. Thus endeth the rant.